Get Ready for Fall Fishing! Great spring fishing has arrived! It’s been too long since last posting new material on my Blog but the past few months have been extraordinarily busy. A heavy book signing schedule from Labor Day through Christmas produced high book sales and kept me on the move. I always enjoy meeting new angling friends at signing events, reliving outdoor experiences and learning things from others. However, many book signings, travel, visitors and get-togethers kept me off the water during much of autumn and the Christmas Holiday season. No complaints, because every minute spent with family and friends was enjoyable. Yet when time, weather and my schedule permitted, I reveled in some fine fishing for trout and bass. The late-fall and early-winter periods are good times to pursue big fish including our most popular game fish; largemouth bass. Fishing for the big largemouths can be rewarding during the cold-water period because fishing pressure is lowest, shallow cover is much less and bass often concentrate in predictable, easy-to-fish places. I caught some nice bass the last few months and learned some things about them that increased my interest in larger fish. One afternoon, after some productive jig and pig fishing for largemouths, I pulled in at a launching ramp and ran into an old friend. The gentleman’s name is Doug Harper, a coworker from the glass company where I worked for many years. He also is a fishing addict and though we have never fished together, we competed in several bass and walleye tournaments, are longtime acquaintances and have always taken time to swap fishing news and experiences when meeting. 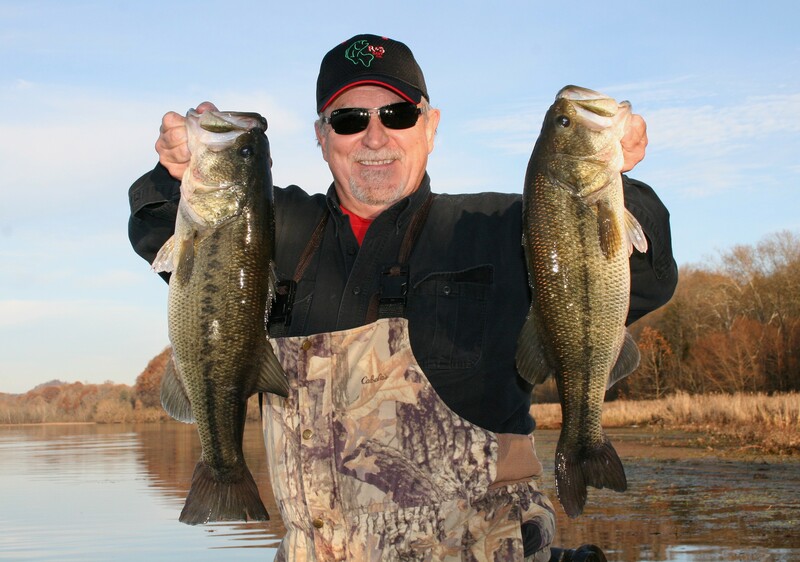 I smiled like a Cheshire cat after recognizing him because the rumor was Doug had caught a huge record-class largemouth and it was going to be my first opportunity to hear about his experience firsthand. After asking about the fish, he confirmed the rumor was true and began telling me about his encounter with a very special fish. Doug Harper and I near the spot where he caught and released his fifteen-pound largemouth bass. 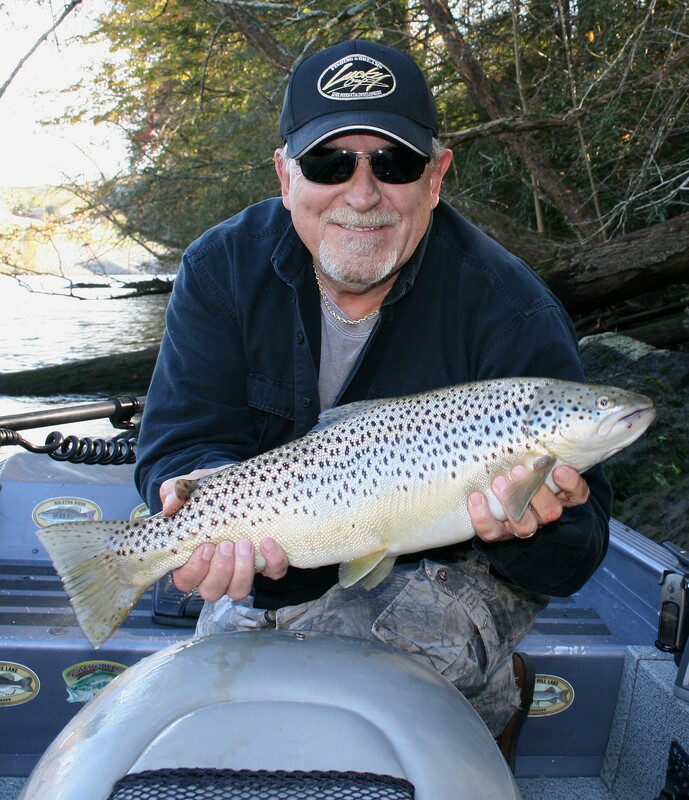 Doug was fishing alone on the Holston River drainage north of Knoxville last May on a day he’ll never forget. Conditions were not the best; the water was off-color and well into his day the bass had refused to strike everything he’d thrown. But Doug remained focused on each cast because he’d caught a largemouth above twelve pounds in the same area a month before. Anglers in another boat confirmed fishing was poor so Doug decided to downsize his lure and slow his presentation. He switched to a spinning combo filled with twelve-pound test P-Line and began rigging a small finesse-bait, a four-inch straight-tailed worm in green pumpkin. Soon after, a small bass confirmed he’d made a good choice when it swallowed the worm. Then a disturbance along shore attracted Doug’s attention so he cast to the spot and began working the worm slowly back to the boat. Soon he felt a barely perceptible tic and the line began feeling heavy. The giant bass had picked up the small soft-plastic bait so lightly that a subtle tap and increased tension were the only indications of a strike. Doug knew it was a monster soon after setting the hook because it ripped line freely from his reel and was difficult to work back to the boat. His heart nearly exploded when the big largemouth finally surfaced. He knew it was his largest bass and close to a state record, so after landing it he carefully placed the fish in his livewell and left for the closest certified scales. With several witnesses present, the fish was weighed at a local market and pulled the scales to exactly fifteen pounds, clearly surpassing the long-standing Tennessee State Record of 14-pounds, 8-ounces that was set in 1954. The fish’s length and girth were not recorded because Doug was concerned additional handling would threaten its survival. Doug was given a weight-verification certificate at the market and left for a local TWRA office for further verification but found it closed when he arrived. With increased concern for the fish, he decided to pass on further recognition and left for a ramp close by to release the giant. After his grandson arrived and took some pictures with an inexpensive cell phone camera, the big bass was released and disappeared into water not far from where it was caught. I admire Doug for refusing to kill such a special fish in favor of watching it swim away to perhaps be caught again. It takes a special kind of outdoorsman to do that. And on a personal note, it will greatly increase my focus and enjoyment when fishing that area, knowing such a fish was released there. Hearing Doug’s story was a highlight to the beginning of my winter-fishing season though it was not the only news I heard about giant largemouths caught in Tennessee. Last month at the East Tennessee Fishing Show in Knoxville, another angler told me about a giant bass caught in Lake Chickamauga that challenged the current state record. It was not the first big-fish story I’d heard about the largemouth-factory that lake has become, but that story raised my interest. Tales of bass above ten pounds and five-fish tournament weights approaching fifty-pounds are becoming more frequent on Chickamauga so I decided to do some research and learn what was behind the lake’s surge of big fish. The Tennessee Wildlife Resources Agency began stocking Florida-strain largemouths in several small Agency-owned lakes in 1998 as part of a pioneer program. In 2000, Chickamauga became the first large reservoir stocked with the Florida-strain, with goals of increasing Florida genes in the population to at least 15% and growing larger bass. The latitude across the southeast where Chickamauga lies is a natural integration zone where Florida- and northern-strain largemouths native to Tennessee overlap; average annual water temperature is the feature that identifies that zone. Other factors TWRA considered when deciding where to stock Florida bass included: the presence of ideal habitat and abundant aquatic vegetation, productive shad populations as forage and acceptance by a trophy-management-minded angling public, which equates to a higher commitment to catch and release. After several years and some adjustments to the stocking-program, TWRA testing in 2013 confirmed the Florida-strain genes present in Lake Chickamauga had increased to about 45% and by then there was no question stocking had increased the number of larger bass in the population. The lake has become such a dynamic fishery for largemouth bass that in Bassmaster Magazine’s list of Top 100 bass lakes for 2014, Chickamauga ranked 7th best in the country. Furthermore, yesterday I stumbled across an announcement while doing further research that the Tennessee state record for largemouth bass has now officially been broken. On February 13th, Gabe Keen landed a 15.2-pound largemouth from Lake Chickamauga that smashed the long-standing record by more than half a pound. I’m not surprised the monster bass was caught during the cold-water period in mid-February. If you enjoy fishing for big bass, or have aspirations of catching the trophy largemouth of your dreams, you too should be fishing for them during the cold-water period. A trip to Chickamauga has already been added to my bucket-list of largemouth bass fishing destinations for next fall and winter. Though noteworthy, my fishing adventures this winter have not been limited to the pursuit of largemouth bass because I’ve enjoyed some good river fishing for big smallmouths. The Holston River where I fish has had lower than normal flow this year because of reduced water generation upstream at Boone Lake Dam. Nonetheless, the smallmouths are still in the river so adjustments to the reduced current have produced some beautiful fish. 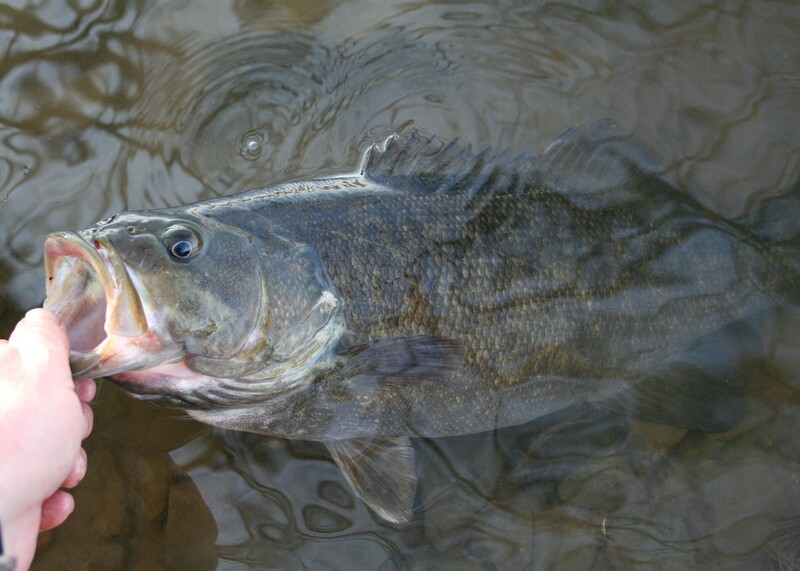 Throughout the cold-water period, I prefer fishing in rivers for smallmouth bass when water flow is highest because it concentrates fish in eddies, often close against the shoreline. When river bass are pushed into places with reduced current, they’re easier to find and catch rates are higher when the correct lures and methods of presentations are employed. In low current, fish scatter, so it’s more difficult to find and catch them. Most times when fish are scattered, it’s best to use high-speed search baits to find them. However, the best way to find and catch smallmouths during winter in a cold river with reduced flow is to use a slow-and-steady horizontal retrieve, a method of presentation that requires discipline and patience. I’ve learned that small, slim-profile swimbaits make excellent search baits in cold-water rivers but using the correct retrieve speed is crucial to success. A variety of swimbait brands work well but those in three-and-a-half to four-inch lengths work best. Vary lure color based on water clarity, depth and light penetration. Less-visible, natural colors draw more strikes on sunnier days in clear water so smoke- or clear-colored bellies with some flashy metal-flake and green or brown backs are top choices. Brighter colors are more visible to fish and draw strikes under overcast skies or in stained water. Even so, with the best color, a tight line and slow, steady retrieve strikes are often difficult to detect. Many times there will be a light tap when fish strike, often engulfing the lure from the rear, but it’s equally common for the line to gradually become heavy from the fish’s weight. It takes practice to tell the difference between a clump of weeds and a strike so when in doubt, set the hook until you develop a feel for a river smallmouth grabbing a swimbait in cold water. Trout fishing is another top choice during winter because trout are a cold-water species and active in lower temperatures, more than other game fish in southern waters. During brief warm-ups I may slip away to fish for bass but during the cold-water period, I fish most for trout. Furthermore, it’s a good time to catch big fish because browns spawn from late-fall through early-winter and larger spawners are active. Rainbows spawn in early spring so they are at peak bodyweight during winter and many become beautifully colored as the spawning period approaches. Similar to river smallmouths, some adjustment in lure selection and presentation will reward you with some of these beautiful salmonoids. As with any game fish, water temperature below a trout’s preferred range slows its metabolism so slower presentations are often best. Trout become less willing to move far to strike lures in lower temperatures so repeated casts or trolling passes are often necessary to make fish strike. Therefore, midwinter trout fishing is often a lower-numbers game but the possibility of catching larger fish can offset the decline in numbers. Lure selection during winter in the waters I fish is simplified because of shad die-offs. During the coldest period of winter, generation below dams spews dead and dying shad pulled through intakes into the tail-waters below. Trout, stripers, catfish and other predators become so focused on this regenerating supply of easy-to-catch food they may ignore other food sources. Take a close look at shad or alewives you see floating along the surface below dams you fish and it will simplify lure selection because choosing the correct lure size is often more important than color. Color and flash draw attention and determine visibility at distance; lure size sells the offering. All three are important when dialing in the best choice in lures but most times lure size trumps the other two. Though I’ve also fished less for trout this winter, I took one special trip to fish for them that was most memorable. My good friend John Flanagan called one dark, wintery day and asked if I’d like to join him for an afternoon of fly-fishing for trout on one of his favorite streams. I had never fly-fished but eagerly accepted the invitation. I met John at a book-signing event in Abingdon, VA last summer and we quickly became good friends. 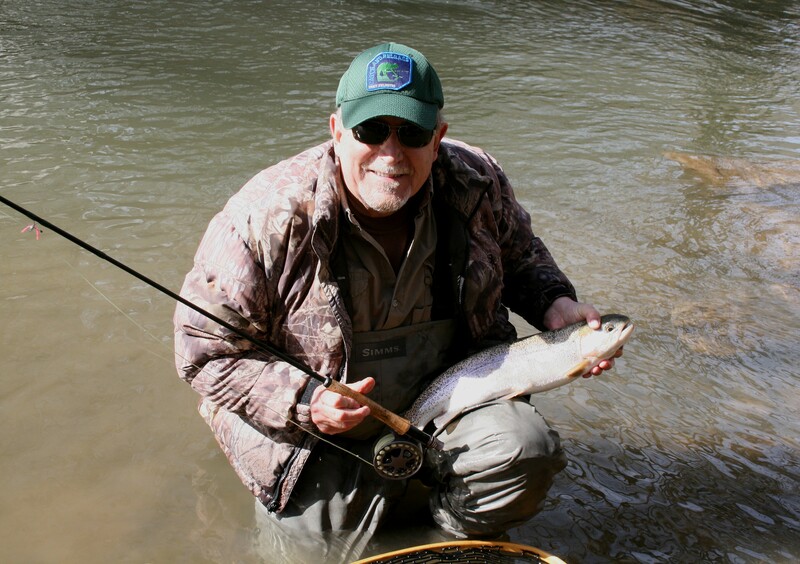 John is a highly skilled angler and serious fly-fishing enthusiast whose credentials include appearances on my friend Curtis Fleming’s television show, Fly Rod Chronicles. So I couldn’t have been more honored to join him and receive some hands-on training from such a talented fly-fisher. We scheduled our trip on a day when the air temperature was forecast to bump fifty-degrees, set a time and place to meet and our adventure was set. A beautiful four-pound rainbow trout I caught on my first fly-fishing trip. When we arrived at the stream, the water was high and stained but our enthusiasm was little affected. John chose flies he believed would produce fish and rigged our fly rods for battle. For the rookie, John set up the fly-fishing equivalent of a bobber and nightcrawler; a float called a Thingamabobber and a fly that looked like a tiny garden redworm called a San Juan Worm on a 3x tippet, known among the uninitiated as eight-pound test line. After an extended but patient class that armed me with a clumsy roll cast and traditional delivery, serious fishing and further casting practice began. I was all thumbs when casting but was very familiar with the quarry, comfortable fishing a small stream and experienced when selecting spots that should hold trout. And the mental image of casting a bobber and nightcrawler increased my confidence. Soon I was attracting strikes and follows from hungry rainbows and in little time landed my first trout. I was most impressed with the battle on that long, limber rod and John had the drag set perfectly on the reel. I gained the greatest confidence in my tackle after hooking and landing a beautiful four-pound rainbow. The big fish charged downstream to the far end of the pool like a torpedo but with patience, I had little trouble working her back upstream to the net. By the end of the afternoon I had proudly landed five nice rainbows, though I’m sure it was not a graceful thing to watch. So I enjoyed my first fly-fishing trip immensely though I expect it may be a long time before Curtis Fleming asks me to be a guest on his show. However, I hope John invites me back soon for more casting practice and great stream-fishing for rainbow trout. If you’re setting at home wishing for an early spring so you can go fishing, you’re missing some good fishing now. Bass, channel catfish, walleyes, crappie and others are grouped together in high numbers this time of year and offer exceptional fishing after you find them. If you prefer fishing streams and rivers, trout and smallmouth bass await. And there are few periods during the year when your chances of catching a trophy are better. If you need help getting started, pick up a copy of my book, The Weekend Angler’s Guide To Good Fishing and you’ll find the information needed to help you catch big fish throughout the cold-water period. Be safe and good fishing! Click here to buy a paperback, Kindle version or to look inside my book! My first reservoir smallmouth bass caught left-handed. The V-wake created by slowly retrieving a shallow-running minnow lure attracts explosive strikes from striped bass and hybrids. Black bass and walleyes are also attracted to this method of presentation. Match lure choice to the size baitfish present, meaning profile and length. Choose color based on visibility. A new ThunderStick out-of-the-box and one modified to present a smaller profile. My friend TJ Blakely from Bass Pro Shop with a winter smallmouth and spotted bass he caught on a local highland reservoir. Swimbaits in natural baitfish colors rigged weedless or on jigheads are good all season choices for highland reservoir walleyes. The upper TVA system in east Tennessee offers excellent walleye fishing for size and numbers with low fishing pressure on many waters. My fishing buddy Harrison Barnes with the brown and rainbow trout that completed his trifecta. A sample of a Tennessee Trophy Fish Award for a hybrid/striped bass, called Cherokee Bass by the TWRA. The former world record brown trout, a forty-pound, four-ounce monster, caught in the tail-waters below Greer's Ferry Dam in Arkansas. Many southern tail-waters produce oversize trout and are premier places to search for a giant. Small jigs are good tools for catching pressured summer bass at night on reservoirs. To rig a Fluke weedless for river fishing, first insert the hook point of a weighted EWG hook in the nose of the bait. Then remove the hook, wet the hook-eye and insert it in the exit hole under the nose. Finish with a standard Texas-rig with the point of the hook skin-hooked on top the lure's back. My friend Zac Morgan with a double-handful of river smallmouth bass. At the East Tennessee Fishing Show in Knoxville, TN with Mountain Man from the Duck Dynasty television show. Doug Harper's fifteen-pound largemouth bass from the Holston River drainage. 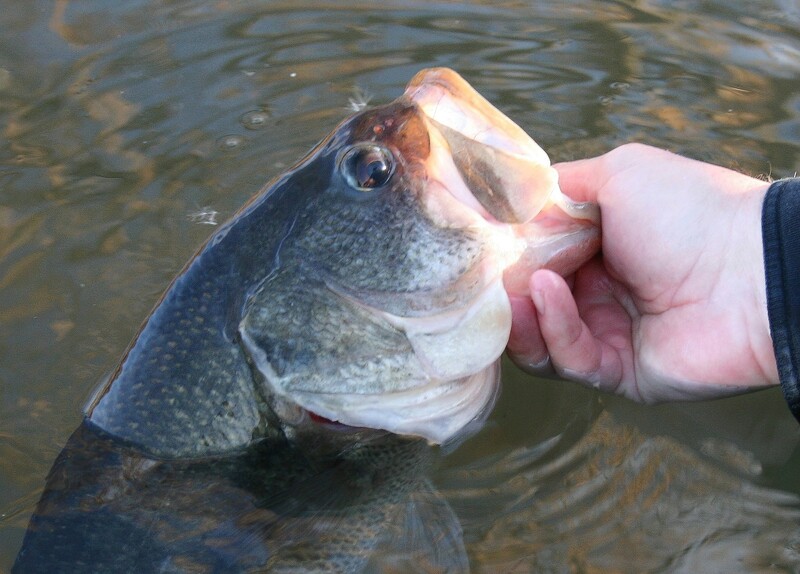 The cold-water period is one of the best times to fish for big largemouth bass. Match lure size to the baitfish present, then test colors until trout confirm you've made the correct choice. 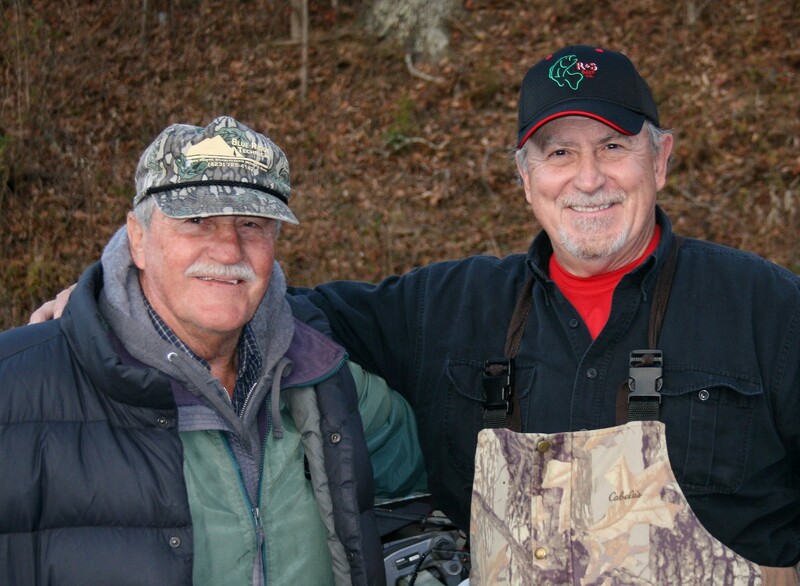 My fly-fishing guide and mentor, John Flanagan. My first rainbow trout on a fly-rod. My wife Tammie with a nice late-summer rainbow trout. Tools for surface feeding striped bass and hybrids include, from top left; Cordell Red Fins in seven- and five-inch lengths, Storm Jointed ThunderSticks and Pop-R's in Super and P60 models. Top right, Heddon Super Spooks in junior and standard sizes. Chrome lures with blue or black backs are staples on most waters but on some, bone or grey colors are top choices. Replace factory hooks with extra-heavy, chemically sharpened models like Owner ST41's and you'll be well equipped. Small cool-water rivers like this will attract striped bass throughout summer. Striped bass like these are excellent table fare so we kept our first double limit. Striped bass creole with shrimp and scallops, one of my favorite fish recipes.